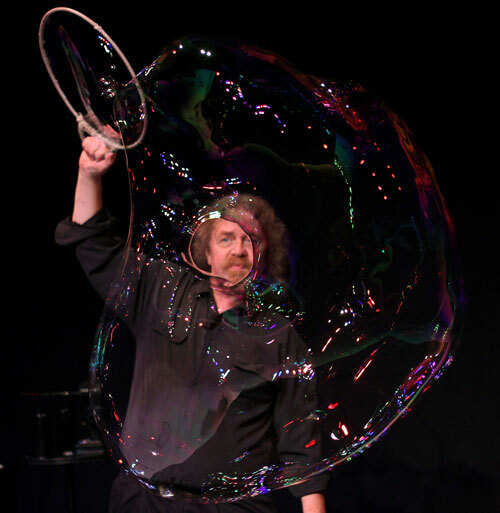 Tom Noddy's Bubble Magic has been featured on televisions shows all over the world over the years. In some early performances Tom used cigarettes but that was long ago and he has developed a handheld fog generator whose fuel is food grade glycerin. Here is a flash look at several of Tom's bubble tricks. An episode of a BBC mathematics programme focused on the math of minimal forms and they asked if I could contribute. We set up in a small theater and exchanged ideas. They filmed the results and edited it beautifully into their programme. I'm very pleased with this one. A British science magazine called New Scientist was asked by one of their readers if it was possible for a soap bubble to produce a torus shape (this is the shape of a inner tube or doughnut). Two mathematicians answered. The first said that it was not possible because soap bubbles always assume minimal shapes and a torus is not a minima. The other mathematician, Frank Morgan, responded saying that he would have agreed but he'd met Tom Noddy. He sent a photograph of me with a Torus Bubble ... here is a photo by the German Photographer Matthias Leitzke showing the torus [insert pic phaeno_Matthias Leitzke] and a video by Israeli bubble enthusiast Romi Shamai showing it in normal time and then in slow motion. The two girls said they couldn't stop laughing. On the question how they thought Tom could do what he does with bubbles one girl answers "I think he has magic in his hands". Question to the boy: "How would you describe the show?" This was a performance by Tom Noddy on the German television show TV Total with Stefan Raab.